Let me start off by saying I do not recommend anyone to rush out and put just any ole 9MM bullet into their ears. This just isn’t recommended. However, the Munitio NINES are something slightly different that if you love to listen to music, then I can indeed recommend you put these into your ears for what might be an awesome music listening experience. I actually wrote an article a few weeks ago about another one of their products that at the time was an on-going campaign on KickStarter. You can see that article here for the Munitio PRO30’s which are an over-the-ear headphone if that’s something you’d prefer to earbuds. Everything about the Munitio NINES has a tactical feel, from the name to the very design of the earbuds themselves. 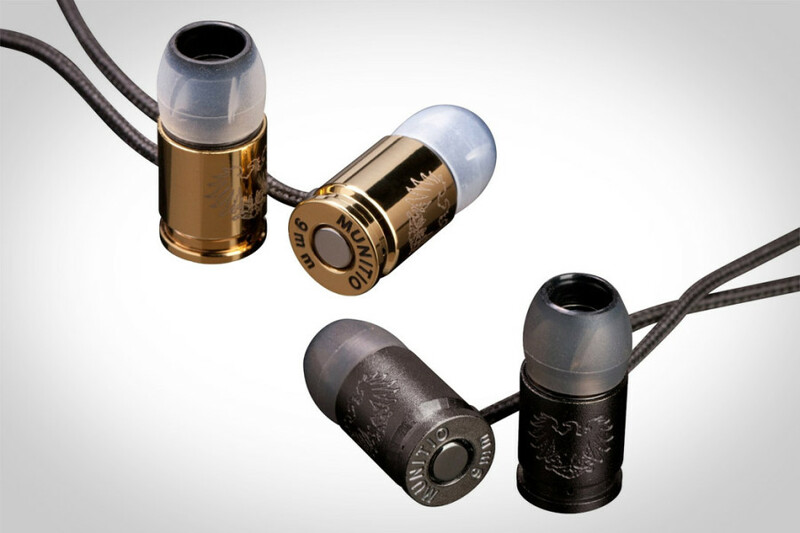 Each earbud looks like a 9MM bullet casing with the actual projectile bullet removed; that’s to make room for what Munitio calls “Hollow Points,” which is their term for silicone eartips. Even those have a complex spiral design that mimics the grooves in a gun barrel. The headphone jack is made of a rough textured metal like the grip of a gun, while the included carrying case is made of ripstop nylon and has a D-ring attachment for added convenience. Even the cable/cord on the earbuds have had special attention paid to them as they have a Kevlar cloth cover over them to give them a “bulletproof vest” feel, to go along with the overall theme of the product. 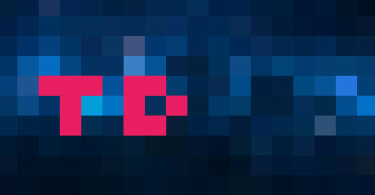 Great attention to detail, look and feel with this product is just one thing that really makes it stand out in my eyes. The Munitio NINES also have in-line volume and track controls within the cords of the earbuds, which is very nice so that you don’t really ever have to touch your mobile device for lowering/raising the volume or skipping tracks that you might not want to hear at the time. 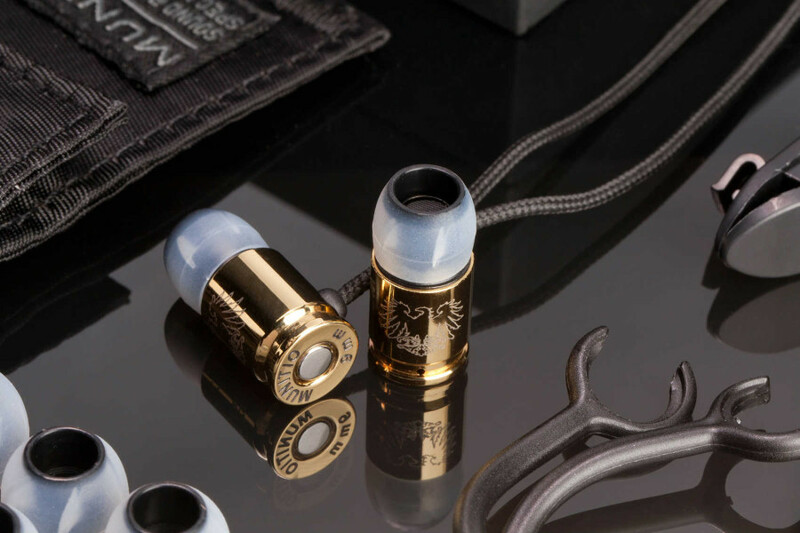 The Munitio NINES come in 3 different colors, gold, silver and black. So if you’re not wanting some bright gold or silver 9MM bullet protruding from your ears, then you can go with something that doesn’t stand out quite as much. The ones I’ll be showing off today are the gold colored ones that Fausto Ochoa, the Brand Relations/Community Manager for Munitio, sent over to me a couple of weeks ago. The Munitio NINES aren’t just a simple pair of earbuds that you pull out of the box and stick into your ears. 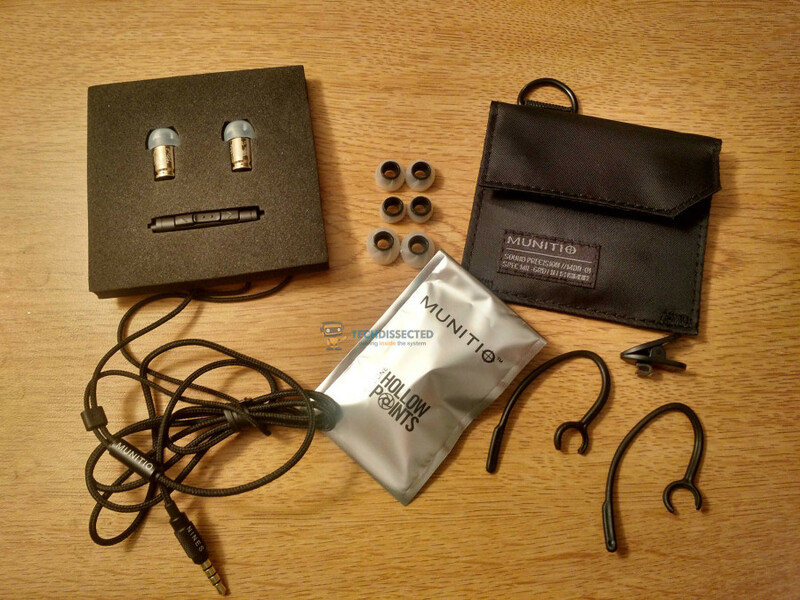 Now I’m not saying they are complicated to work with and to get to where you can put them into your ears and to start listening to music, there’s just a few accessories that are important to note that Munitio supplies in the box. Munitio includes a pair of over-ear hooks that are completely removable, which is not something you often find when it comes to companies that produce earbuds. The hooks clip on at the end of the earphone casing(where the rim of the cartridge is), and can rotate completely around the center of the earphone itself. I found the ear clips to be particularly innovative compared to other headphone manufacturers designs because they offered a unique second option for getting a better fit. Most earbuds come with the standard S/M/L tips(as do the Munitio NINES), and that’s important for me because I have a smaller ear canal than most people it seems.So having these options might allow for you to find a more comfortable fit by using a smaller or larger tip. But that’s not always the case and even with several sizes to choose from, comfort just might not be quite the way it needs to be. 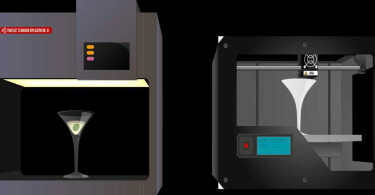 Some manufacturers attempt to solve the problem by including a plethora of tips with varying designs, like double-flanged or memory foam options, but those may still fail to help. For me, the NINES’ small tips were pretty comfortable for me, but they still felt slightly off. After playing around for a bit, what I found worked for me was the medium sized tip and the over-the-ear hooks. 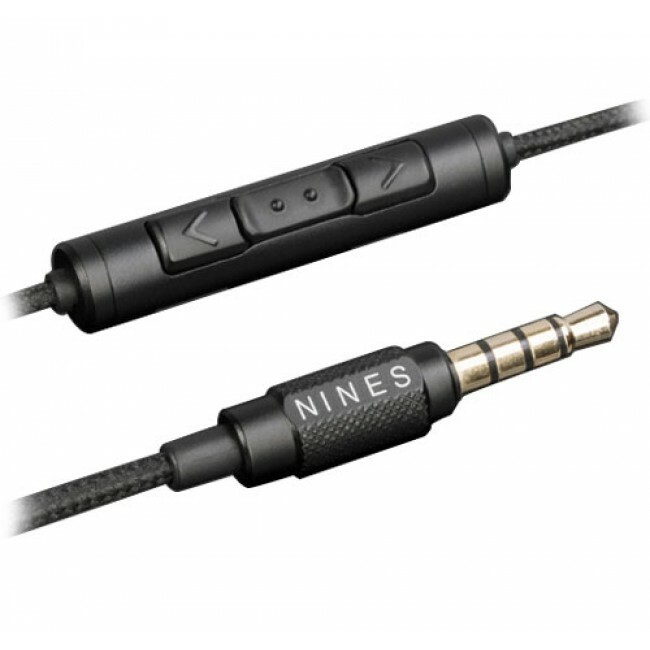 Paired together, the medium tips and the over-the-ear hooks felt superbly comfortable and gave me what I felt was the best sound quality I could hope for from the Munitio NINES. As mentioned above, the Munitio NINES comes in three colors but no matter which model you choose, the NINES deliver stellar performance with big, warm sound overall. As the name implies, the NINES feature 9MM drivers, and two bits of custom engineering to maximize the audio experience. The SoundFlow tuning enhances mid and high-frequency performance, while the BassEnhancingChamber pumps out clear-yet-booming bass. Both features deliver a cleaner, bigger sound than you might expect from such small drivers and from a earbud that most people are going to think are made more for looks than for their sound quality. I listen to a slew of different genres of music such as older music from the 80’s like Bon Jovi, Poison and others, as well as today’s country music and even alternative music. By doing so, I give myself a better chance of really testing a product like the Munitio NINES to see how they handle several different types of music. While the country music provides quite a bit bass, the Munitio NINES pumped it out clearly and in an exceptional manner. There was no distortion that I could tell even with the volume turned all the way up at times, just for testing purposes. The alternative music that I listened to such as Shinedown, Linkin Park and a few others, gave me a true test of highs and mids and again there were absolutely no issues at any volume level. The Munitio NINES consistently pumped out high quality sound without giving up in any area unlike most other headphones or earbuds. For the price of anywhere from $85 to $150 for the Munitio NINES, I highly recommend them to anyone looking for a really good pair of corded earbuds. Certainly they aren’t and won’t be in everyone’s price range, what you get with the extra tips, over-ear-hooks for a better fit, a cord that won’t tangle near as easily as others, high quality built earbuds and of course great sound quality, you can’t really go wrong here. Plus throw in the fact that you’re going to be showing off earbuds that look like 9MM bullets which you know all your friends will be asking you about and you’ve got a solid winner. You can pick up a pair in any of the three colors by clicking the links below. The gold ones will set you back about $85, while the silver ones will set you back $115 and then the black ones will cost you right at $150. So the choice is yours, but please let us know in the comments below which ones you decide to grab.